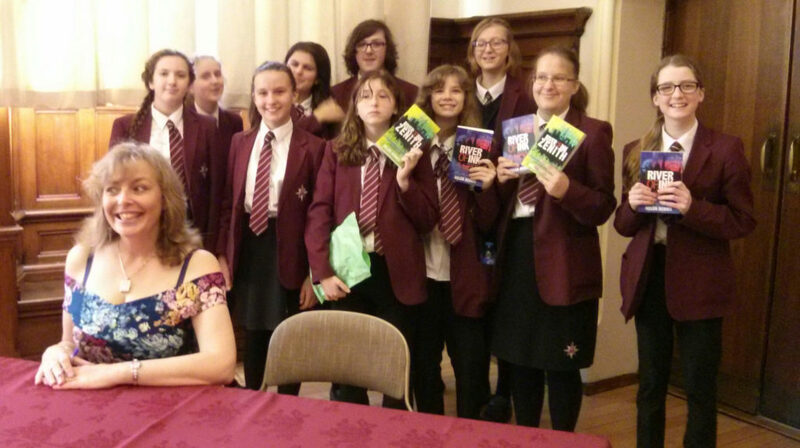 Year 9 meet award winning author, Helen Dennis at Hampshire Book Awards ceremony. The culmination of the Hampshire Book Awards 2017, saw students take a trip to The Winchester Guildhall, after students from fifty schools in Hampshire judge a shortlisted set of six books and vote for a winner. The highly anticipated event is always a highlight in the calendar, after students from fifty schools in Hampshire judge a shortlisted set of six books before voting for a winner. This year’s winner is Helen Dennis. Famous originally for her ‘Secret Breakers’ series. The first in her ‘River of Ink’ series came out in January 2016 and was nominated in the shortlist for the Hampshire Book Award. It is a thrilling adventure full of engaging characters with a plot that keeps the reader thinking right to the end, and then wanting to go straight on to the next book! The story starts on a cold London day, where a teenage boy washes up on the banks of the Thames. He remembers nothing. Not who he is, not where he’s from, or why he was in the river. Helen was a bright and exuberant speaker. She illustrated her speech with slides including a photograph of her seven-year-old self as a budding writer. At this early age she declared to her parents that she wanted to be an author and required somewhere to write. Her mother set her up in the old outside lavatory building where Helen spent a couple of hours a day after school engrossed in writing stories. Helen explained that one of her greatest positive influences was her Year 7 teacher who made every day a story and embedded self-confidence in her that she could achieve. It was very interesting listening to Helen describe the process she goes through to produce a book. She explained that less than ten per cent of the time taken in creating a book is actually spent writing. She spends many, many hours reading and researching and planning before starting the writing process. The session ended with a Q&A. One question addressed the intriguing symbols at the beginning of each chapter; “what do they mean?” asked one student. Helen explained that these represent the passing of time. Helen was clearly delighted to be presented with her Hampshire Book Award and then moved into another room to briefly chat to the students individually as she signed their books. Our students described this event as “amazing” and one girl stated that she found Helen “inspirational”. Find out more about Helen by visiting her website and come in the school library for a copy of one of Helen’s great books to read.